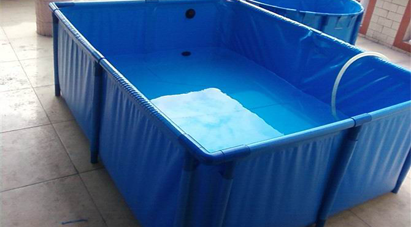 In Aufmevic, we produce various sizes of Tarpaulin collapsible fish pond in Nigeria. We are based in Lagos but can supply our mobile collapsible fish pond to any part of Nigeria. We produce according to your specification which is determined by the space available. A mobile foldable fish pond or what some call tarpaulin fish pond (because it is made from a PVC material) is ideal for those who live in urban areas with little space available for your fish farm. This new mobile pond grows fish very fast and can be used for fish culture in any environment. Some of the advantages of the tarpaulin fish pond is that it is Easy to assemble and move about, it is also cheaper than concrete made fish ponds.